Description: Symbolizing spiritual enlightenment and the union of heaven and earth, “Tree of Life” portrays a universal motif in a unique context of curlicues and gleaming gold leaf. Created by renowned Viennese Secession and Art Nouveau genius Gustav Klimt (1862-1918), the piece features the lavish ornamentation and gold embellishments prominent in his work. 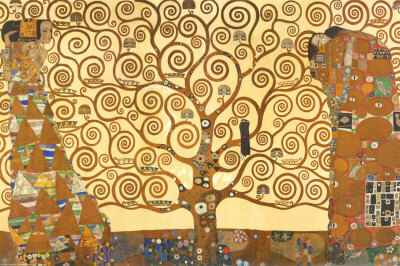 A forerunner of Modernism and the Art Deco movements, Klimt’s enormous creative influence still resonates in modern art, decorations and jewelry.